The sale reason: creation (sanitation) of new business with its further sale. 1. The land: 3648 sq.m. 2. Industrial and office premises: 1882 sq.m. 3. 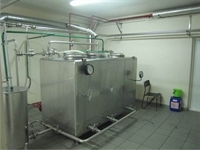 The equipment: the complete set of the new equipment of manufacture of the countries of the European Union, allowing to make 4000 liters of beer a day and to spill it in kaggs, freshkaggs (beer is on sale on the installations for pouring-98 pieces) and bottles (contracts with networks are concluded). Under condition of additional investment at a rate of 65000-75000 euros capacity can be increased to 9000 thousand liters a day. At present the factory works at full capacity. 3. The registration certificate of the status of the enterprise which is in especially supported territory - the special economic zone allowing the right to a discount at a rate of 90 % on the tax to real estate and a discount at a rate of 50 % on the profit tax, and as priorities in reception of means of the European Union on manufacture development.